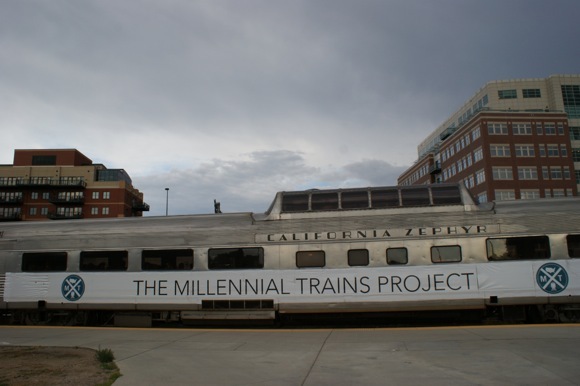 In its second annual run coming later this summer, the Millennial Trains Project will pass through Michigan, with Detroit as one of the program’s 8 cross-country stops. Earlier this month we examined the motivations of the increasing numbers of young people who choose to travel by rail, and found that convenience, enjoyable passenger experience, and price were among the most important factors. Another attraction of rail travel is the time and space it opens for innovative work and creative expression. As one Michigan State student expressed to me, the lack of focus on the road and traffic allows open time for writing, reading, and thinking. Programs such as the Millennial Trains Project, and the Amtrak Writer Residency harness cross country passenger rail as a platform for aspiring entrepreneurs and writers to advance projects that are in the early idea stages. The Millennial Trains Project (MTP) is a non-profit that “leads crowd-funded transcontinental train journeys that empower diverse groups of creative, entrepreneurial, and civic-minded Millennials.” The first trip successfully crossed the country last summer traveling from San Francisco to Washington D.C., and the second trip will embark from Portland Oregon on August 7th and travel for ten days ending in New York City. Notable for Michigan, the project makes a stop in Detroit this year. Patrick Dowd, founder of MTP, recognizes that the beginning and end points of this year’s journey are “well-known meccas for young people who seek to change the world through technological innovation and public service” but last year “most of the participants came away more intrigued by the opportunities for growth” that exist in the stops made along the way. The train acts as a vehicle for innovative and inventive development in cities, much like Detroit, that have fallen on recent hard times, by investing in “human and intellectual capital” to create financial capital. Any of the first twenty applicants that are able to raise $5,000 via crowdfunding by July 1st secures a place on the train. One of this year’s applicants, Jessica Meyer, has already reached that mark, and plans to focus her project on the Detroit area. Meyer’s project 313exchange is a community development project focused on Detroit. She wants to create “a knowledge and skillshare community designed to tap into the hidden talents, skills, and experiences” of people who are unable to fit into the “innovative and collaborative” culture of Detroit, such as unemployed, elderly, disabled, autistic, or ex-convicts. Both programs emphasize the train as a conduit for creativity. MTP fosters the creative space of travel while utilizing the train for its intended purpose–to transport individuals where they need to go. For Amtrak Residency the journey itself is emphasized for the useable space it creates, rather than simply what lies at the origins and the destinations. Dan Zak, a writer for the Washington Post wrote, “The American spirit thrives in transit,” even in a decidedly skeptical article concerning the residency program. Another author that Gross quoted, Mark Synder, said “I think the act of working, surrounded by other people living their lives, can be quite a compelling act for yourself. It makes me feel less alone.” The Amtrak Residency program is currently selecting applicants, with intent to send the authors on journeys over the course of this summer. Rail ridership can offer more than just a cost-effective ticket, or the opportunity to use travel time for leisure or productivity. It can also serve as an outlet for young entrepreneurs and creators. In Michigan young entrepreneurs have a unique opportunity to significantly impact the direction of our state’s economic comeback. We already have Detroit Bikes, and Detroit Labs, among others. Transportation is a key aspect of cities that these pioneering millennials choose to live in. 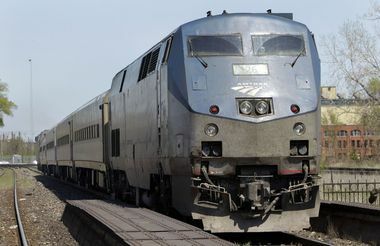 Ventures like MTP and Amtrak Residency push these concepts even further, taking the benefits of train travel beyond the convenience and price, to the social, creative, and productive aspects of passenger rail. The location of rail hubs in major cities, prevents Amtrak from being useful for its highest function, namely a commuter service for daily trips to major cities for business, visits, shopping and connections with major airports. This may be easily accomplished without requiring new technology or high-speed trains, simply by moving the points of daily origination to the mid-points between major cities. This minor change to the system will multiply ridership overnight and not have any impact on the historic use of passenger trains for transcontinental travel.